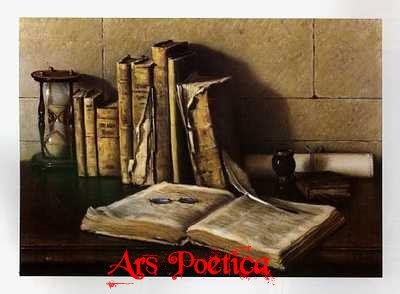 "This is a themed blog (poems about poetry) that will lead to a print anthology. 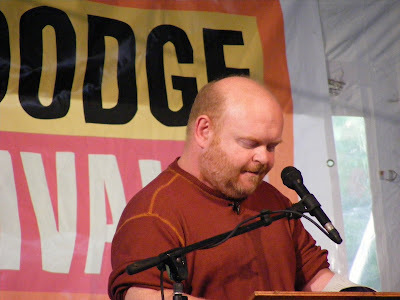 Dan Waber invited five of his favorite poets to send him an ars poetica they'd written along with the names and email addresses of five other poets. He then invited those twenty-five poets to do the same. He then invited those hundred and twenty-five poets to do the same. He then invited...you get the picture." I was invited to submit I think about two years ago. I had a quick acceptance, but when so much time passed, I concluded that I'd been cast aside. So Dan's note this morning came as a lovely surprise. The culmination of Dan's plan will be an anthology published by Paper Kite Press, a small press in Kingston, Pennsylvania. The press is run by Dan and his partner, Jennifer-Hill Kaucher. They also run an art gallery and a reading series. Sherry Chandler recently let me know that my publisher, Charlie Hughes, of Wind Publications in Nicholasville, Kentucky, has received one of the 2007-2008 Governor's Awards in the Arts. 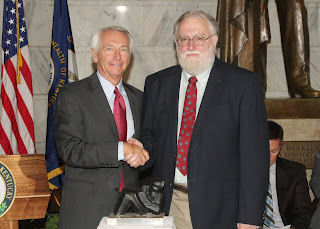 He received the award for his contributions to the arts in Kentucky. I was already happy to be one of Charlie's poets; now I'm even more so. (That's him on the right.) As is true of most, maybe all, small presses, his is a labor of love. In addition to running his press, Charlie compiles the Kentucky Literary Newsletter, an online newsletter available for free for subscribers. It's a wealth of information and a wonderful service for those interested in the literary arts. By profession an analytical chemist, Charlie also served for many years as the editor of Wind Magazine. When he moved into book publication, he turned the journal over to a different editor. Now retired, he devotes his full attention to Wind Publications. Here's a short video of Charlie that was made after he received his award. 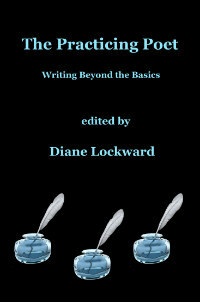 It provides a behind-the-scenes look at how a small press works. I've never met Charlie in person—all of our communications have been via email—so I really enjoyed seeing his work area. I remember when he was building it. How nice to be surrounded by all those books! Look closely and behind Charlie you'll see my book, Eve's Red Dress, standing on the shelf. Towards the end of the video, you'll see Charlie taking a copy of my book, What Feeds Us, out of a box. I'll confess that those two scenes gave me a nice little thrill. Congratulations to Charlie for this well-deserved honor. I'm delighted to be the subject of an interview with Robert Lee Brewer at Poetic Asides, the Writer's Digest blog. The interview is part of an ongoing series of interviews that Robert does with poets and editors. The interview is preceded by a brief introduction and a sample poem from my book, What Feeds Us. Robert's choice of sample poem both surprised and pleased me. Then there are eight questions. I don't ramble on too long, so check it out. While there, you can sign up for Robert's email list. He'll let you know when a new interview is posted. He also posts regular prompts for poets who are looking for ideas. I had no assignments on the last day so was free to pick and choose. 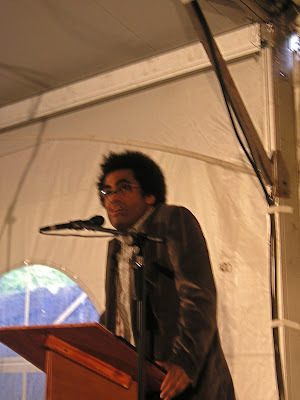 My plan was to go to "Conversation: The Poet As Citizen" with Chris Abani, Lucille Clifton, Robert Hass, and Ted Kooser. But that turned out to be the plan of a lot of people. By the time I arrived at the tent, it was packed. 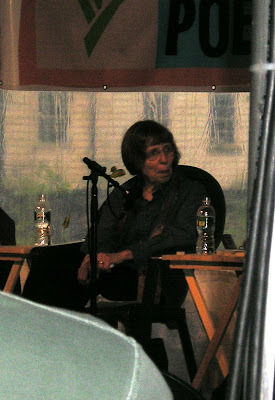 I had to stand at the periphery of the tent, outside and subject to the rain that was starting to fall. So I decided to just head for the nearest tent and take whatever was there as long as there was a roof overhead and a chair below . I landed at "Conversation: Going Public with Private Feelings" with Franz Wright, Linda Pastan, and Martin Espada. This picture came to me courtesy of Anthony Buccino. My move from one tent to another turned out to be fortuitous. This was a terrific session. As I arrived, Martin was saying that as a lawyer he values privacy, but as a poet his responsibility is not to his particular family but to the human spirit. It was obvious from the audience's questions that there's excessive concern about offending people. One of the panelists pointed out that most of the people you worry about offending won't ever read your poems. Wright spoke about the struggle with self-consciousness and our desire for attention. He spoke of his unique position as the son of a famous poet. He shared his recollection of wondering if his father's poems were about him, and he acknowledged feeling some pain about that. Pastan said there are no poems that she won't write. All agreed that the standard for going public is the poem itself. The final decisions are more technical than personal. I agree completely with this observation. Someone asked if more things happen to poets than to other people. Pastan replied that she's lived a very ordinary life. She claimed to be more daring in her poetry than in her life. That resonated with me. I've said very much the same thing about my own life and poetry. Someone who had previously met Pastan and been disappointed to learn that the facts in her poems are not always real facts said that she now understands more fully that poems aren't autobiographies. Martin added that poets make up stuff in the service of truth. I loved that as a closing point. This is an ongoing subject of debate among poets. I always get annoyed by the people who assume that the poem is and must be full of facts. Seems to me that's not their business. Their business is the poem. and Franz Wright. A terrific reading! Had my last lunch in the Meeting House and headed on home with a long list of books to buy. Saturday morning I arrived in time to catch the final minutes of Conversation: Poetry As Disruptive Seed, Poetry As Centering Force. Poets above are Chris Abani, Robin Robertson, Martin Espada, and Patricia Smith. The poets were asked, "How do you deal with poetry when there is evil?" Martin replied, "I don't." He said the evil produces the poems, creates the tension that fuels the poetry. Patricia added that poetry brings peace, is at least a start. It helps us and others confront what's bothering us. 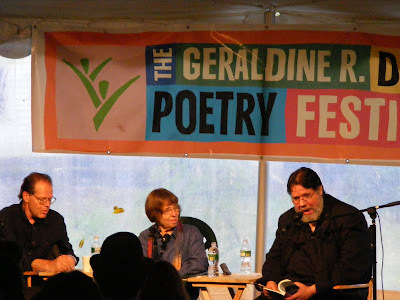 Then I remained in the same tent for a real powerhouse of a reading with Jan Beatty, Patricia Smith, and Joe Weil. With each one I thought that I sure wouldn't want to go next. But each of these poets completely held the stage. 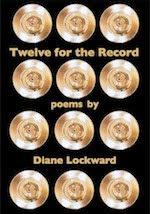 Jan's poetry is delivered in a fairly soft voice but is hard-edged, tough stuff. I liked the contrast between delivery and subject. Patricia Smith is a past National Slam champion. She recites entirely from memory and is like a stick of dynamite! She read several persona poems, each in a different voice. Very convincing. 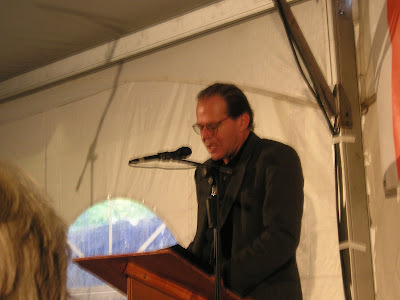 Joe Weil was the final reader. Thanks to Anthony Buccino. You can find photos of many other poets as well in Anthony Buccino's album. These three poets received a standing ovation from what looked like several hundred people in the audience. One thing I don't get is why anyone would go to an open reading and miss the readings by the poets who are part of the festival. And yet I heard that most of the opens had more readers than could be accommodated. My first assignment of the day was introducing Dovie Thomason, a storyteller. 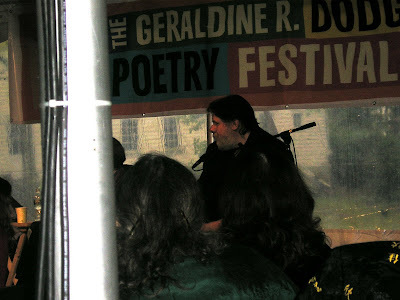 Then after lunch I went to the Main Tent to hear Linda Pastan, Chris Abani, and Sharon Olds. 1. For a lyric poem the maximum number of occupants is two—"me and the reader." This creates intimacy. 2. Begin with something any reader can accept. Then he's willing to accept something more challenging later. Start at the shallow end and lead the reader in. 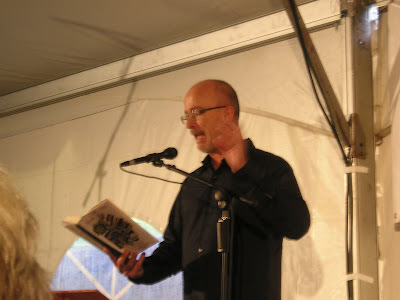 I was interested to hear Collins say that he writes a poem in one sitting. He gets the next line before he moves on. He revises as he goes along. This is definitely not me. My first drafts are all over the place. And there are many drafts. I don't look for form until I'm pretty well along. But in spite of several points on which I disagreed, this was an interesting conversation and gave me much to think about.